Once you start using avast! Free Antivirus, you quickly realize what a quality product it is and want to share it with your family members and friends. 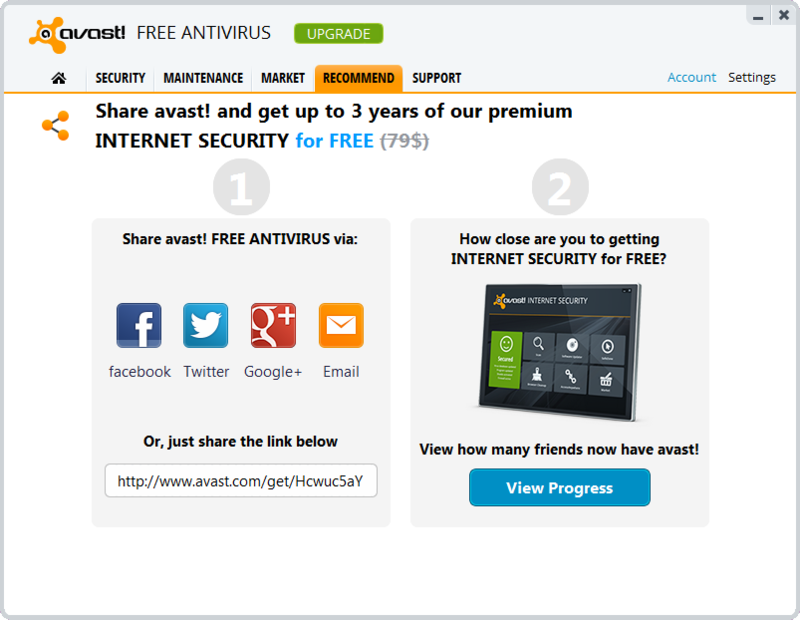 We have created an easy way for you to recommend avast!, and at the same time earn points toward a free 1-year license of avast! Internet Security. First, you need a my.avast! account. If you don't have an account it is simple to create one. All you need is an email address or Facebook login. Go to http://my.avast.com to create yours now or open the avast! program and go to the “Recommend” tab. I’ll tell you some benefits of having an account at the end of this post. Once you have a my.avast! account, you can recommend avast! Free Antivirus using your very own special download link. Share this link with friends or family easily through your social networks or email. Once your friend installs avast! from your link and starts using it, a credit is counted toward your my.avast! account. When you reach 7 friends, you can download your free Internet Security license. If you have lots of friends, you can keep going – 14 friends, you get a 2-year license; 21 friends, you get a 3-year license.